This delicious Lemony Kale and Quinoa flavor-packed dish is ready in under 30 minutes. 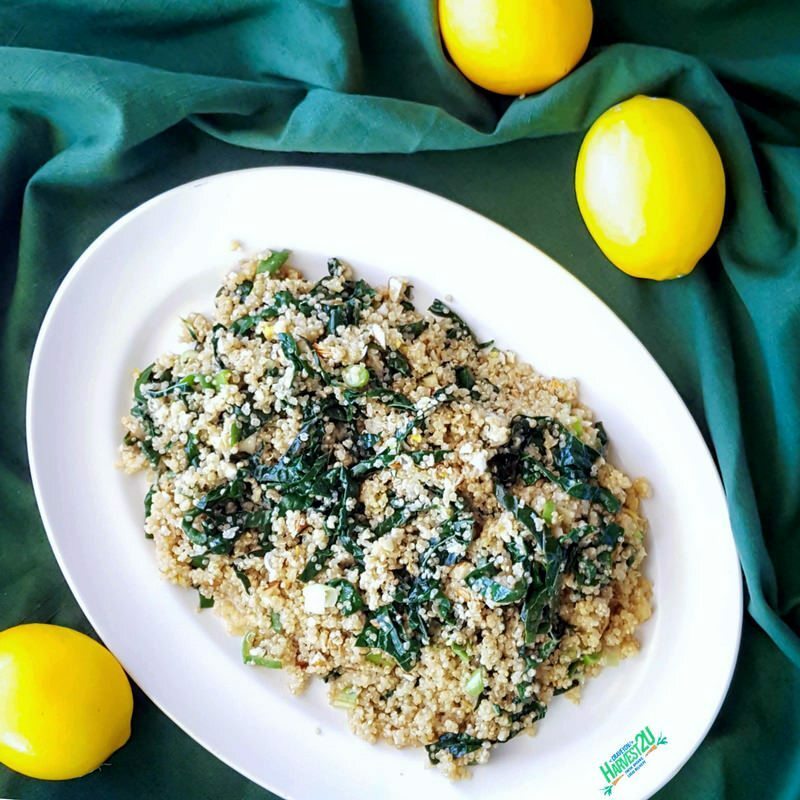 It packs quite the heart-healthy punch with the vitamin-rich kale and lemon combined with the good fats in the quinoa, nuts and olive oil. Lacinato (Tuscan) kale is a bit easier to use in this recipe because of its long flat leaves, but curly kale will do if that’s what you have. In a medium saucepan bring broth to a boil. Add quinoa. Reduce heat, cover and simmer for 10 minutes. While quinoa is cooking remove the center stem from kale and cut into 4 big pieces. Roll the pieces and cut into thin strips. After quinoa has cooked for 10 minutes, add kale on top and recover. Simmer for 5 minutes, then remove from heat and let the pan sit covered for another 5 minutes. Chop scallions and place in a medium bowl. Zest the entire lemon and juice 1/2 of it (save the other half for another use), adding both to the bowl. Add olive oil and chopped nuts. Add kale and quinoa to a bowl, stirring until ingredients are thoroughly combined. Serve warm or chill for a few hours to enjoy as a salad.